In 2019, over a century after the Great War ended, is there anything left to say about it, you might ask. And I would reply, a fair bit actually – the Irish involvement is still pretty under-told, as is the Indian, African, and Australian. How about the Armenian genocide snuck right in the middle of it all? Don’t hear much about that. And, you know what, now that I think about it, I don’t know much about the Canadian troops either. And unfortunately, after two hours of John Gray’s ‘Billy Bishop Goes to War’ I still don’t. In fact, the title could easily double as synopsis: Canadian Billy Bishop, a fairly average young man, goes to fight for his King, his motherland, his “home away from home”. And there he learns that war is bad, that taking part in a war can sometimes feel good, and that you never forget how good and bad it all was. 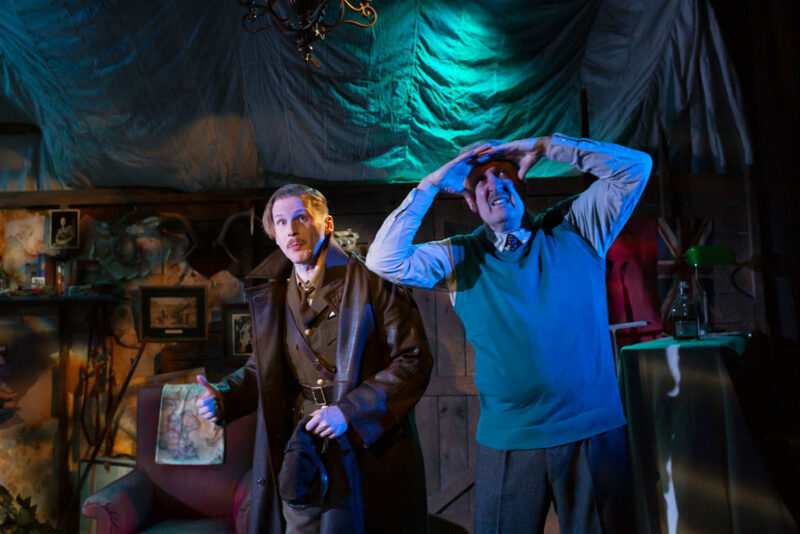 But we know that’s how it’s going to go from the very start, as old-man Billy Bishop (Oliver Beamish) enters with a lurching gait in to his bunker-style man-cave, half-bottles of whiskey, mounted antlers and various WWI paraphernalia all scattered about. He is soon followed by his younger, uniformed self (Charles Aitken) to tell the tale. The whole play sits in that first tableau, and if you’re waiting for a twist in the plot, it’s not coming. Predictability aside, Beamish and Aitken both make a good go of it. Beamish’s Canadian accent is a little shaky at times, but he more than makes up for it with his other Blackadder-esque British military characters. Aitken’s accent is more consistent but sometimes takes precedent over his delivery. Similarly, he shines in the more comical role of elderly socialite Lady St Helier. Neither man is afraid to take up space, or to throw their physicality behind a variety of parts, each playing at least five or six different characters. The whole play takes place in Bishop’s hidey-hole, giving a sense of playing even as he sits in a cockpit, shooting at German planes and recounting pilots plummeting to their deaths. In this way, the set (Daisy Blower) supports the music (John Gray) in swiftly backing away from any emotional weightiness – any time Bishop experiences loss or trauma, there’s a song to make it nice and catchy. Wake to find two sleeping corpses in your trench? Let’s sing about it! Incidentally, both actors sing pleasantly enough, and Beamish accompanies nicely on piano.